Fab was born in San José, Costa Rica where he developed his love for the outdoors and nature. As a child, he was known for his hyperactivity, which he transferred into sports such as volleyball, football, and eventually triathlons. He loves being active and outdoors, as he finds himself best in nature, surrounded by the sounds of the birds or the breeze hitting the top of the trees. He is convinced that learning how to respect yourself, nature, and other perspectives leads to a better world. 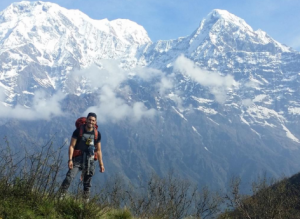 It was upon travelling to Asia for the first time a few years ago, that he found his passion for Outdoor Education while working for different companies in the area. He enjoys traveling and challenging himself in new, unfamiliar situations. He knows that there is no better way to improve and grow than to step outside of his comfort zone and face his fears one at the time, always with a positive mindset. He has been also working for the Rain Forest Outward Bound School based in Central America, leading experiential learning trips in Costa Rica and Panamá. Fab also holds the Wilderness First Responder, First Aid and CPR, Technical Ropes Rescue: Operations, International Rafting Federation Guide Class III and PADI Open Waters Scuba Diver certifications as well as the Instructor`s Judgment and Sea Kayak Training. And he is super excited to meet you all!